Deshamanya Marhoom Al Haj Mohammed Abdul Bakeer Markar's ancestry is traced to Sheik Jamaluddeen-Al-Maghdoomi, an Arab settler who settled down in Beruwala. His father Hakeem Alia Marikkar Mohomed Marikkar belonged to a family of physicians, whose ancestors too were physicians. So much so his ancestral home was known as Hakeem Villa which meant Veda Gedera (Home of the Physician). It is said that patients even from Maldives visited him for treatment. Abdul Bakeer Markar was born in Beruwala on May 12, 1917 and educated at Zahira College, Colombo under the tutelage of Dr. T.B. Jayah, the Principal of Zahira College. He held a number of responsible and honorary positions at Zahira, such as Editor of the College Magazine, President of the College Majilis and the Literary Association. 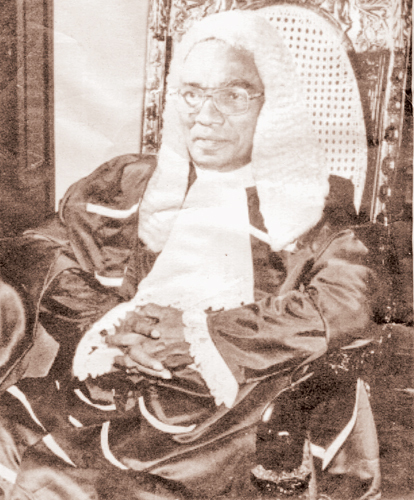 He entered Colombo Law College in 1940 and having passed out as a lawyer, he had a lucrative practice and was elected President of the Kalutara District Branch of the Bar Association of Ceylon. Since his childhood, he exhibited his humble qualities which I presume was the road to achieve greatness, win respect from people of all walks of life and attract intimacy from the society. The family history which claimed great social activity, especially due to the ancestry running with Medicine, made Al Haj Bakeer Markar very popular among everyone in the area, irrespective of race, religion, caste or any other differences. No wonder he was enchanted to politics as a consequence and the public was enchanted with gratitude to elect him as their representative too. Al Haj Bakeer Markar’s life as a politician was even more illustrious than his life as a lawyer. His upbringing from a popular family and friendly mannerisms were reasonable grounds for it to happen. He was first an elected member of the Beruwala Urban Council and later appointed its Chairman. His next step in the political ladder was to become the Member of Parliament for Beruwala. He was reelected and continued from April 1965 to March 1970. He was the Deputy Speaker from August 4, 1977 to September 7, 1978, and succeeded as Speaker from September 1978 to August 1983, a Cabinet Minister and the Governor of the Southern Province from June 13, 1988 to December 1993. His name, which was equal to honesty and integrity in politics, is immortalized in the history of the Parliament of Sri Lanka, of being the last Speaker of the Old Parliament, and, the First Speaker of the New Parliament. His service to the people was so great it was convenient for his son Imthiaz Bakeer Markar who inherited and possessed great qualities to be elected to serve the Beruwala Electorate as the Member of Parliament and even to serve as a Government Minister latterly. Here it is relevant to note what WJM Lokubandara stated at the Condolence Motion on Al Haj Bakeer Markar; that some fathers receive recognition from their sons, and some receive recognition from their fathers or mothers, but it is rare to find the son and father to be concurrently great Sri Lankan sons. Al Haj Bakeer Markar was an accomplished parliamentarian and was truly, a dedicated representative of his people. His contribution to parliamentary activities were highlighted when the Condolence Motion was taken up in the Parliament. Prime Minister Ranil Wickremesinghe highlighted how he presided over the Parliament to create new systems to deal with the issues related to building relationships between the Executive President and the Parliament and the manner in which the responsibilities were to be discharged to Parliament by the Prime Minister and the Cabinet. Similarly there were new relations to be developed between the Judiciary and Parliament and PM Wickremesinghe stressed that at that stage Al Haj Bakeer Markar’s interventions were crucial. It is during his tenure the Parliamentary Consultative Committees and Public Enterprise Committee were established. All these strengthened the working of the parliamentary system. Al Haj Bakeer Markar’s impartiality was greatly admired at this Condolence Motion by Karunasena Kodithuwakku, WJM Loku Bandara, Chandrasiri Gajadheera et al, which was a salutation to his role as the Speaker of the House. Al Haj Bakeer Markar, by not caring for ethnicity, race or religion received grand support from the Sinhala community than any Muslim candidate from any political group. Al Haj Bakeer Markar’s such commitment was well observed from the fact that he educated his son Imitiaz Bakeer Markar at Ananda College, a leading Buddhist educational institution, though he had been a teacher at Zahira College Colombo at the inception of his public career. To prove Al Haj Bakeer Markar’s correctness in educating his son at Ananda College, his son also excelled in debating in Sinhala, like his father, becoming a trilingual. Both of them were impartial and strived to promote harmony among all ethnic and religious groups, exhibiting productive continuity of positive constructive attitudes. I have had an official experience with Al Haj Bakeer Markar which I may mention to prove his morals and metal in politics, which were firm and based on democratic values and tradition. On that occasion he did not want to read the Address to the Southern Provincial Council in 1994, as wished by Colombo, since it was not conventional. I along with the then Minister of Provincial Councils John Amaratunga had to be involved in a tough negotiation to adjust his stances to appease the powers in Colombo and to bring political sensitivities of non-confrontation. I believe such experiences leave great sensible and sensitive lessons to incumbent Governors for now and even for future too. As a Muslim leader he was the Founder President of the All Ceylon Union of Muslim League Youth Fronts and the Vice President of the All Ceylon Muslim League. Further, he was the Chairman of the Beruwala Maradana Mosque Jamaath until his demise. Al Haj Bakeer Markar served also as a Goodwill Ambassador of Sri Lanka. His close connections with the Iraqi Government enabled him to build a village in Eravur, and was the founder President of the Iraq-Sri Lanka Friendship Association and remained in this position until his demise. He was honoured and appreciated by the President of Indonesia for his assistance to Indonesians when an aircraft crashed with Indonesians on board. Thus, not only was he a son of our soil, he was also a citizen of the world. Youth development and fostering the youth for community development and service was another aspect, which he actively promoted, and, he founded the All Ceylon Muslim Youth Front, with sincere objectives, and now, is being successfully continued by his son Imitiaz Bakeer Markar. Al Haj Bakeer Markar’s services also in the field of education of the Muslim Community were unique and had been appreciated even by opposing Muslim political leaders. When all these aspects of his life is considered in a nutshell, one will observe a very wholesome life of a man who dedicated himself to the society, sans any discrimination, dedicated to politics, youth, religion, especially to the Muslim community without any problems created to other communities and also treating others as equals. Many critical socio-political issues we experience now among communities would not have subsisted if politicians followed the path treaded by Al Haj Bakeer Markar. He imagined a world better than the one he lived in and strived to make it a reality. He could be therefore considered as an epitaph of a great personality whose principles of life should be emulated by the current leaders, especially those who try to create social commotion built on religion, ethnicity, language, regionalism, social inequality and mean economic issues. May he be remembered for all those great qualities, which should be reincarnated. At this instance when looking back at his life and review lessons learnt, we may easily conclude that we need many more Bakeer Markars of the make of Al Haj Bakeer Markar to mount Sri Lanka as a greater nation- especially sans jealousy, strife, conflict and commotion. At the remembrance of Al Haj Bakeer Markar, I take liberty to quote the Quran, in AL Baqarah 2.197, which says “Take a provision with you for your journey. But the best provision is al- taqwa, which is piety and righteousness”. He deserves respect and honour because he was conscious and cognizant of Allah, of truth, of the rational reality- “piety and fear of God”. Therefore, Al Haj Bakeer Markar’s life was a sincere collection of al taqwa for his journey beyond this life and this world. It is very appropriate if his life is emulated by politicians, social workers and civil leaders. On a personal note I find sad is that no one from his very immediate family has committed at present to carry in similar fashion the holy voyage, which Al Haj Bakeer Markar embarked.